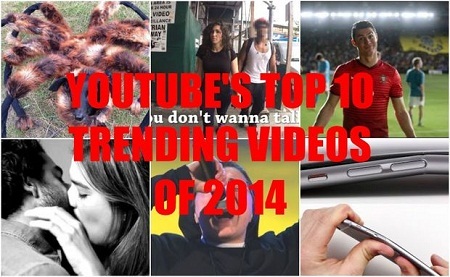 Download Top Trending YouTube Videos 2014 for Free to Apple, Android, Sony, Microsoft, etc. Every year YouTube singles out top trending videos of the year based on the views, likes, shares, searches, parodies, remixes as well as responses. So, what are the top 10 trending videos of 2014? YouTube shared the top trending viral videos of 2014 in early December. "Mutant Giant Spider Dog" with more than 113 million views hits the number one spot. And the views still keeps increasing dramatically. "iPhone 6 Plus Bend Test" by Unbox Therapy ranks No.5 in the top 10 trending videos 2014. If you want to free download top trending videos of 2014 or other popular viral videos for offline playback and sharing with friends, a free YouTube downloader can do you a big favor. How to Free Download Top Trending Videos? Free download top trending YouTube videos and more easily. Download and convert top YouTube videos to common formats & devices (Apple, Android, Sony, Microsoft, etc.). Check the full list of the top 10 trending videos of 2014 here. The video views are updated on December 25. If you're interested in these videos, just move to the next part to learn how to free download top YouTube videos. How to Free Download Top Trending Videos of 2014? Here, a free, clean and safe online video downloader called WinX YouTube Downloader is recommended to free download top YouTube videos, like "Mutant Giant Spider Dog". It is expert at downloading SD, 720P, 1080P, 4K UHD and 3D YouTube videos. With Multi-thread and Multicast Technology, it enhances audio video sync and delivers 5-8x real-time download speed (depending on the internet speed). Download and install WinX YouTube Downloader, and then you can perform top YouTube videos free download as follow. For Mac users, please try the YouTube downloader for Mac. Step 1. Search for target video in YouTube, play it and paste the video URL to the downloader. Tips: You can get the top trending videos from YouTube Rewind. Step 2. Click "Analyze" to fetch video information. Once finished, choose video resolution and click "Ok" to move to next step. 720p, 1080p or 4K UHD? Suit yourself. Note: If you want to download all of the top trending videos at one go, just repeat step 1 and step 2 before any further. Step 3. Hit Download button to free download top trending video(s) fast. In addition to free download top trending videos of 2014, you can also use this tool to download YouTube top trending music videos of 2014, such as Katy Perry's Dark Horse, Shakira's Can't Remember to Forget You ft. Rihanna, Taylor Swift's Shake It Off and so on. If you plan to download top trending videos of 2014 or other YouTube movies, shows ,music videos, funny video clips and more, and also convert them to mainstream formats (AVI, WMV, MP4, MOV, FLV, MP3, AAC, iPhone ringtone, etc.) or fashionable portable devices (iPhone, iPad, Samsung Galaxy Note, HTC, Sony Xperia, Xbox, etc. ), please turn to WinX HD Video Converter Deluxe.